Next morning we got up at about 5.00 a.m. & transferred to jetty for our boat leaving before 6 o’clock. We arrived at Sittwe airport around mid-day for our early afternoon flight to Ngapali Beach. The flight is about 45 minutes. We were met by the hotel staff from the Ngapali Bay Resort & Spa. 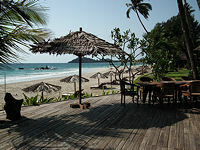 This is a new 5* resort in a central & good location on the beach. 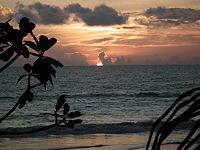 It is next door to another deluxe hotel that we are using in our Deluxe hotel category, The Sandoway Resort. 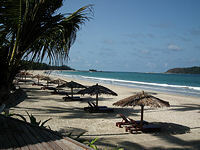 We arrived in Ngapali Beach on 27th April which is the last week for most of the resorts before closing for the summer season (rainy season) from May until re-opening again in late September. Because of this the hotel is very quiet with only a few guests. If you wish to have the whole empty beach to yourself without fighting for your sun deck & best table in the restaurant for your breakfast this is the best week to come for the beach, the last week of April. The hot sun is still here in the cloudless sky. 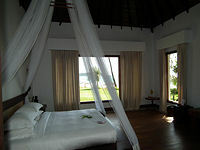 The Ngapali Beach Resort & Spa has 4 room types, the sea view room, the beach front room, the pool villa & the suite room. 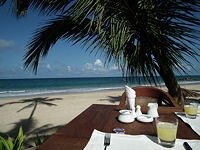 They are all wonderful with views of the sea & the white sandy beach. We stayed at the beach front room. This has to be the best sea view room that I have stayed at among many beach resorts that we have stayed in our travel business. The room was large & luxurious. The best feature in the room was the large window almost the size of the entire wall on one side of the room looking out to the beach & the sea. We could see & hear the waves rushing up on to the shore. For the beach front room you also have a private open patio under a thatch roof with chairs & table just outside the room across a path. This is the best place for a sunset cocktail drink. Our room was a few steps from the sandy beach. This has all the ingredients for anyone who loves beach & sun. Tonight we had the best meal in Myanmar. This local restaurant is called The Silver Star. It is about 5 minutes walking from our hotel. It is right opposite to our next door hotel, Sandoway Resort. We ordered grilled fish, chicken curry & fried watercress. They were all sensational. The fish & meat were cooked to perfection, fresh, moist & tender. The curry is not the usual curry in a sauce but a dry curry with a chilli spice taste. The grilled barracuda fish was the best I have ever tasted & dipped with some chilli, ginger & garlic sauce to go with it. It was out of this world. We had to request to see the chef for these wonderful dishes. The chef came out smiling - a young man of about 26 years only. His name is Tun Tun Naing. His 3 dishes rated as one of my 3-5 all times great meals that I have eaten since travelling around South East Asia for our travel business in the last 10 years. He was very happy to hear that & so were we very happy to have tried his fantastic cooking. I told him I will return in my next trip to his country. Next day, 28th April, was our only free day on our own without any business involvement on this 2 weeks trip. We got up around 8 & had a breakfast lingering for over an hour long, having the hotel's beach side terrace to ourselves for most of the time. The sun was bright, the sky was clear & the beach was empty & the sound of the waves gently running on shore almost as if to greet us for the day. For a brief moment I felt as if I owned this place. Occasionally we saw local women with a straw trays of exotic fruits on their heads walking past We moved from our breakfast table to a sofa nearby with more coffee. Our breakfast lingered on. My colleague, Rob, & I have decided that today we would do nothing but enjoy the beach. 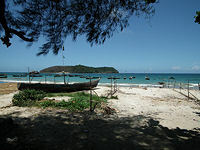 We began walking from our hotel beach to the left toward the fishing village. We passed several more hotels along the way, but only a few guests among many unoccupied sun loungers. A local guy approached us for a snorkelling trip. I told another woman with straw tray of fruits on her head to come to see us later in our hotel for purchasing her fruits. 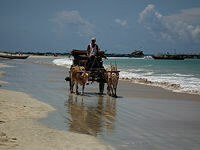 An ox cart was driving along the beach for delivering goods to the local village. We reached the fishing village with sights of fishing boats floating on the clear blue-green sea water. We found a tree for shade - it was a very hot day. I believe it was over 90 degrees. We walked off a narrow lane among the local houses and stopped at a local shop for more bottled water. We have drained all 3 -4 small bottles of water walking along the beach. We needed to refill in this heat. The cold bottle of water the shop owner sold to us was like water in the desert. The mid-day sun was by now on top of us. We were on the main road walking back to our hotel. Most of the local people withdrew into their own houses because of the heat. We stopped again for more water from a roadside shop. It was the hottest day I have experienced. We finally stopped at the famous Two Brothers restaurant for lunch. It was a lovely local restaurant with more tourists in it. The food was not bad but nothing like last night at Silver Star. We walked back to our hotel & enjoyed our beach. All the women I promised earlier in the day to buy their fruits were gathering round & laid their trays down on the beach with display of different exotic fruits. There were five of them & I brought one fruit from each of their trays. We had bananas, green coconut & mangoes. We watched the sunset with our cocktail drinks on our private patio.